In the minutes before 47SOUL open their 90-minute set, the Jazz Cafe in Camden is dense with anticipation. Their opening track, Mo Light, sends us straight into a frenzy of cheers and impassioned two-stepping. Whining synth and onerous drumbeats boil over into chants of “We’re good we’re good we alright / They’ve seen us alive / We’re good we’re good / We just need more light.” The potency of the track matches the energy in the room, setting the precedent for a high-octane night. 47SOUL have accrued a cult following thanks to their signature brand of ‘shamstep’ - they intersperse Arabic melodies with thudding 808 beats and are palpably influenced by hip-hop, dancehall and electro. Rooted in dabke, shamstep takes its name from the Levantine region of Bilad al-Sham - a vast area spanning Syria, Lebanon, Palestine, Jordan, Cyprus and Turkey from which all four of the group’s members hail. As artists from the Palestinian diaspora, 47SOUL have overt themes of community, identity and displacement. After a couple of years living in the fast-gentrifying area of Tower Hamlets, though, their lyrics have taken on a fresh duality. Friday’s gig coincided with the release of their first full-length album, Balfron Promise, which takes its name from both the east London tower block - Balfron Tower - where the record was created and also refers to the Balfour Declaration of 1917 by which the British promised support for a “the establishment in Palestine of a national home for the Jewish people”. Balfron Tower’s original residents were ‘decanted’, and in their music 47SOUL confidently juxtapose this with Palestinian displacement. The set was a perfect blend of old favourites and the most delicious sonic offerings from their new release - the 2015 track ‘Don’t Care Where You’re From’, with its anthemic hook and militaristic feel, was a highlight of the night. 47SOUL are the type of band that have to be seen live to be fully appreciated. Each member gives their all to every single track, without it ever feeling contrived. The band’s MC, Walaa Sbeit, bounces between Arabic and English and delivers verses with mesmerising conviction. 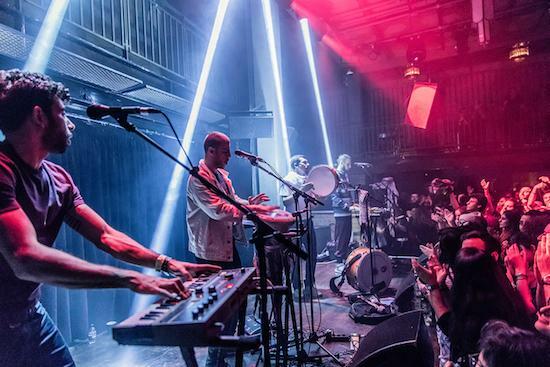 They bring a formidable stage presence: irresistible percussion and affecting vocal delivery make for a compelling live experience.